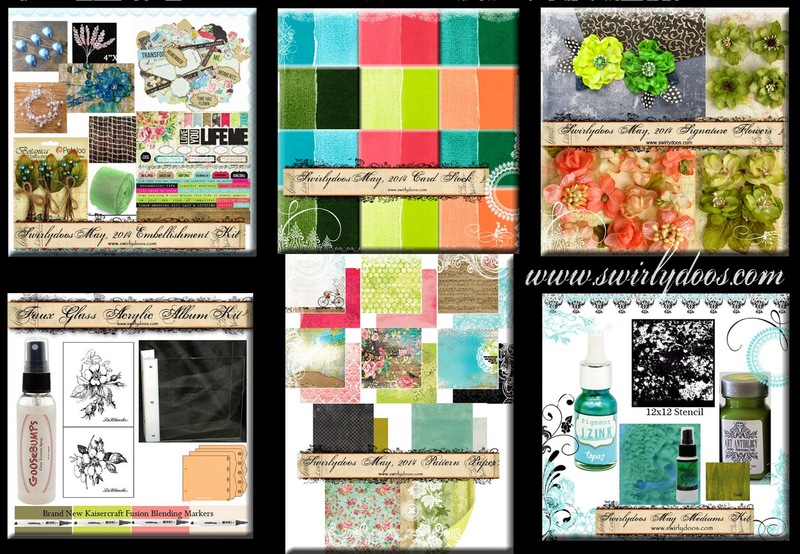 Scrapping Fancy: Swirlydoos May Reveal and Blog Hop! Swirlydoos May Reveal and Blog Hop! If you came here from the Swirlydoos blog, then you are on the right track. We have some amazing projects for you to see today!! Make sure to leave a comment on all of the blogs for a chance to win!!! Make sure you have LIKED & FOLLOWED Swirlydoos on Facebook!!! 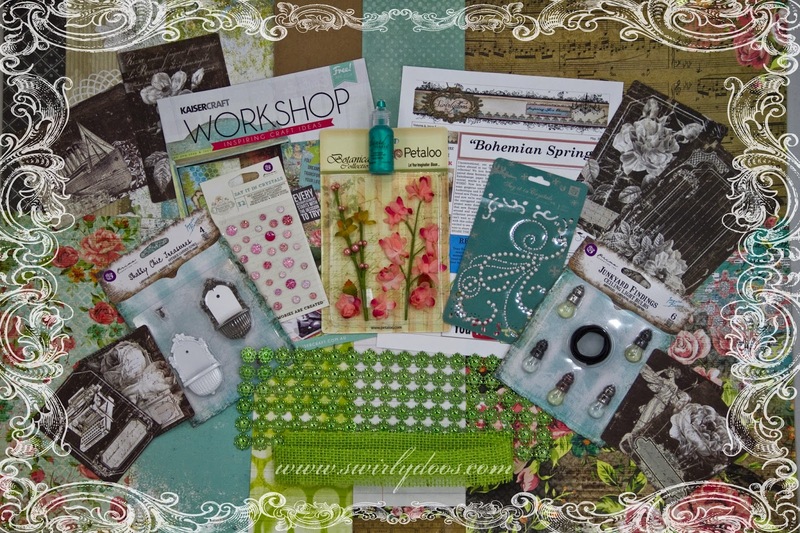 And check out these coordinating add ons that perfectly compliment our May scrapbook kit! Are you a subscriber? If so, your kit is on it's way! If not, check out the Swirlydoos store to see if there are any May kits or add ons in the store! Oh my word! I am soooo in love with this kit! I have been yearning for Spring, and it was so much fun to play with this kit, Bohemian Spring, because it is full of color! Here's what I've made with the kit so far. 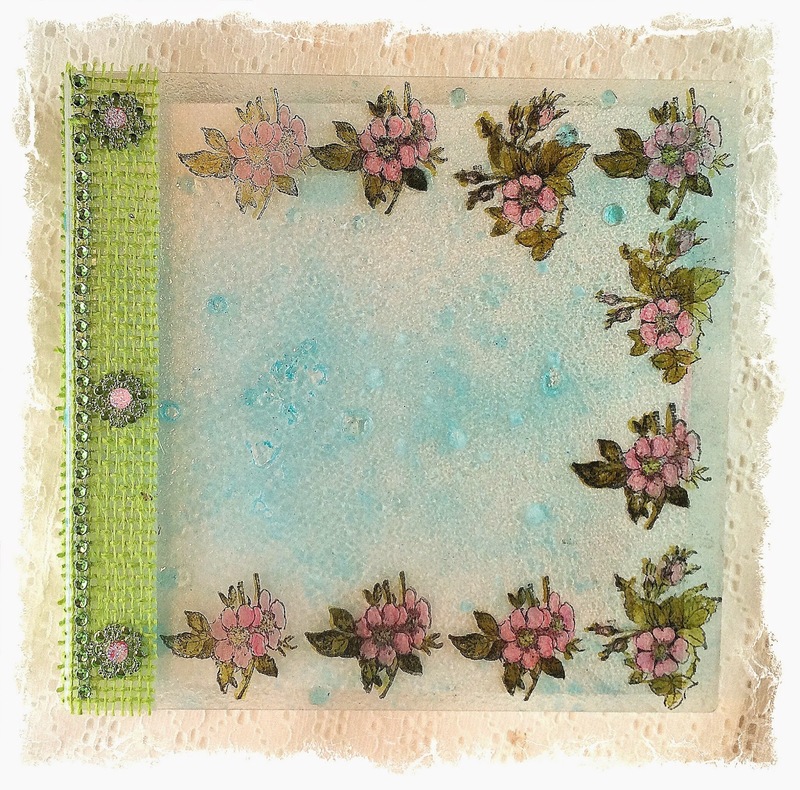 When we were at Winter CHA, we saw an amazing album in the Clear Scraps booth, and that was the inspiration for this month's project add on. I had so much fun trying this "faux glass" technique using "Goosebumps" texture spray; I will definitely be use it again. I LOVE how it looks! Here's a close up of what the texture looks like. I added some alcohol ink to the Goosebumps spray. I used a couple of Memory Box dies for the frame. Here's the back of the album. And, this is the side view. 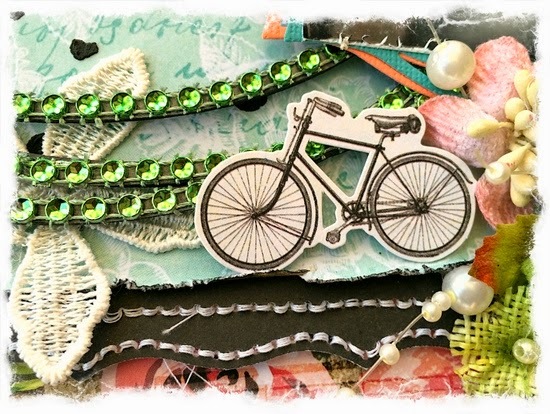 And, on May 10th, be sure to check out my Saturday tutorial on the Swirlydoos YouTube channel to see how I finished the inside of the mini album using more of this fabulous Bohemian Spring kit! This picture is of my cousin's daughter. She is a lovely young woman, and when I saw this picture she posted on Facebook, I immediately snagged it to use for this kit! When I first saw this kit, I had so many ideas about some elegant, feminine pages, but I kept thinking about how a lot of the elements in this kit would be PERFECT for masculine layouts! 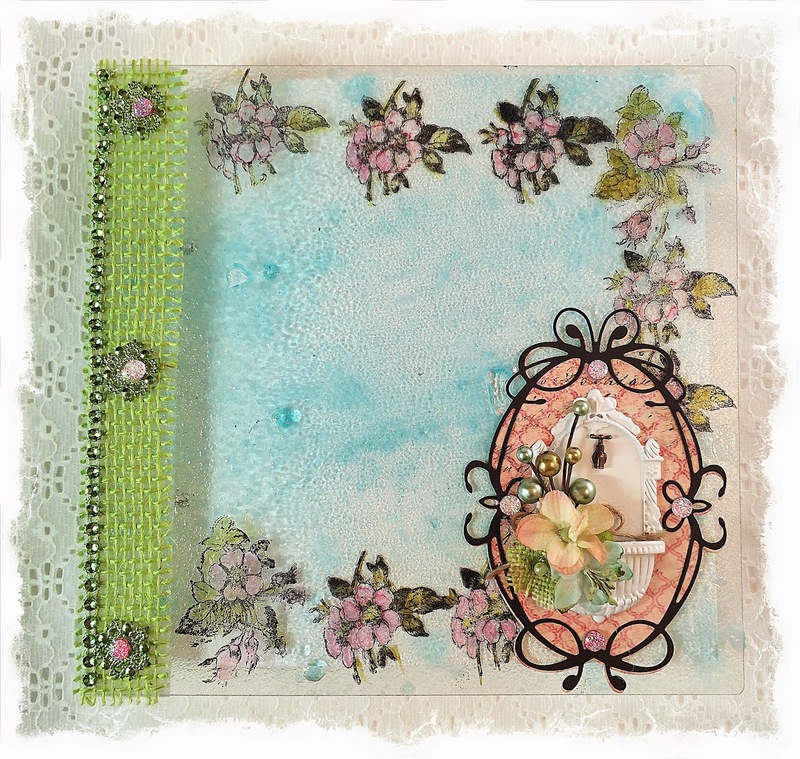 So, I decided to host a "masculine" page challenge using this Bohemian Spring kit. All of the ladies on the design team have made masculine pages too, and they are amazing! If you are getting the kit this month, be sure to play along. The challenge will be posted on the Swirlydoos forums. 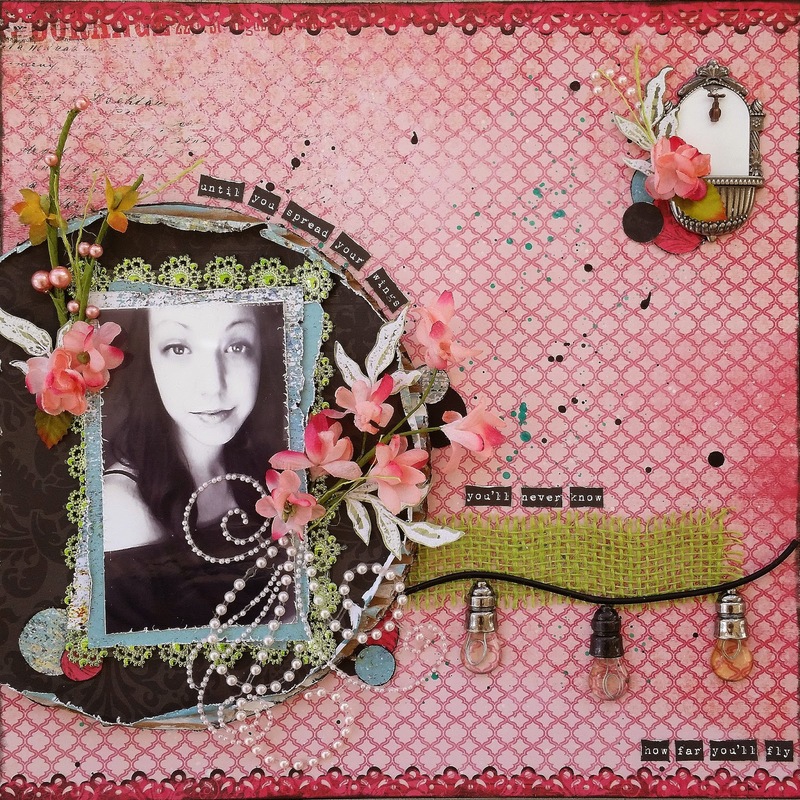 I used every product from the mediums add-on on this layout! I started out with the cardboard piece from the main kit, and tore off the first layer of it. I painted it with gesso, and while it was still wet, I sprinkled some of the dry Lindy's from the mister bottle on to it and gave the gesso another swipe. I added some black ink over it to give it the distressed look I was going for. For the top layer, I used the Prima stencil. I applied both the Izink and Art Anthology Sorbet paint to the stencil with a sponge in random spots as if I were stippling it. Then I rubbed the sponge to BLEND the two media. The Izink is SUPER blendable! The trim poking out from the bottom layers came in the embellishment add on. 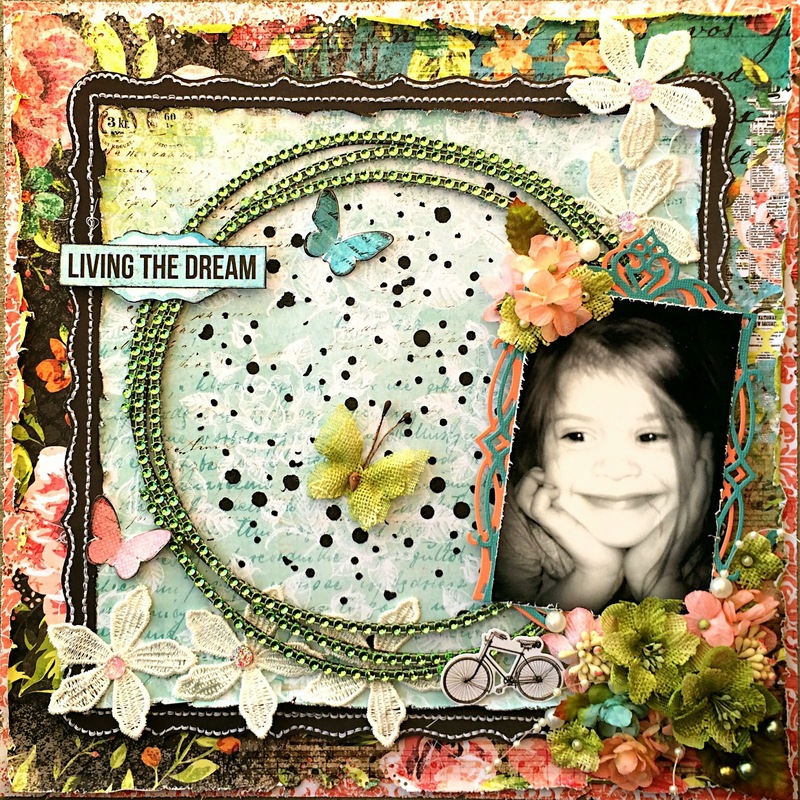 The chipboard circles are from my stash, from Blue Fern Studios. The cattails are die cuts from a fabulous Die~Namites die! I'm doing double duty for this layout, as it is my submission for the Swirlydoos Round Robin Challenge for week one. :) The twists are to use lots of flowers, and flower patterned paper, so I've done that. I also added some white flower trim for good measure. 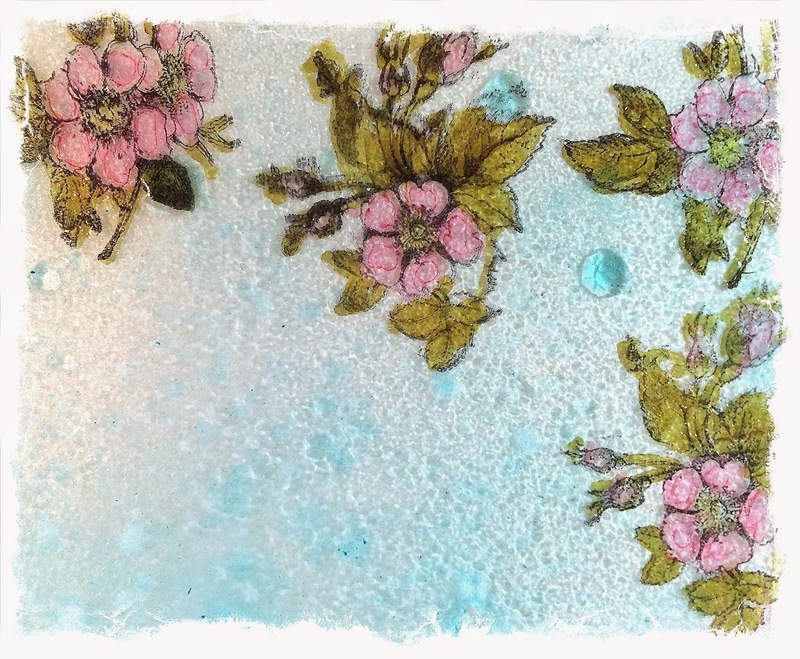 I have twelve flowers, and used two different pieces of pattered paper that have flowers. Here's a close up so show some of the details. The black layer was made with the Martha Stewart "Cherish" punch, and I used white thread to hand stitch around it, using the punch as a guide. It's time consuming, but I adore the look, and it's been a while since I added some real stitching to a project. I love the look of it. 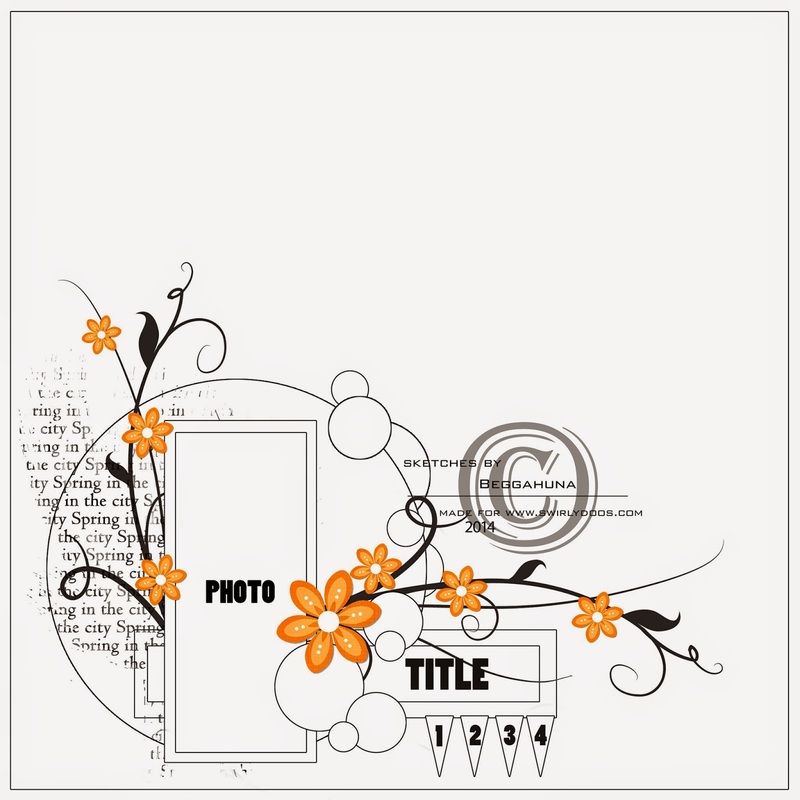 The frames under the picture are from Sizzix. I couldn't decide which color I wanted to use, so I used them both. :) The other frame, the green bling circle (Hey, that rhymed!) is made with some bling from the embellishment add-on. 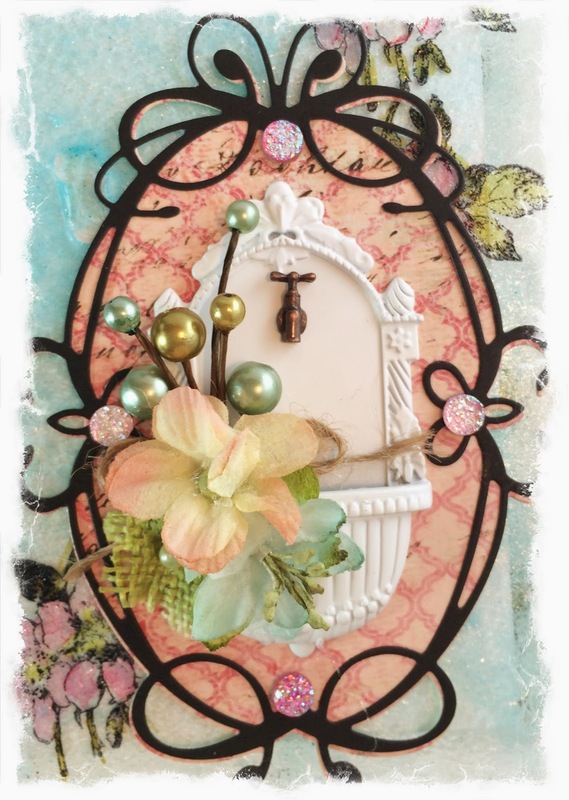 I used a piece of Blue Fern Studios chipboard (nested circles) as a "template" for placing the bling. To complete the look, I added some pearl trim from the embellishment add-on to the flower cluster. I also added some stenciling with a Heidi Swapp stencil and Wendi Vecchi black embossing paste inside the circle. I hope you enjoyed checking out my projects, and I can't wait for you to see what the other ladies have made! The party continues over at Tracey's blog. Have fun! So many great projects! Can't pick a fave! Rae, your projects are so beautiful and I really love your album cover you created! sewed your way into my heart again this month. stitching is always fun. Rae, you outdid yourself this month! I absolutely LOVE every single project your created!!! Rae First of all they are all great, but I really like that you describe how you did each of them. I really appreciate that. And Owen is Awesome, looking cool for school (look I rhymed too), lol. Beautiful work Rae ! Love what you did with the mini. Oh Rae... I soooooo love your beautiful projects. The texture, the goosebump gave is amazing and I love your fabulous detail work. Eeeek! I LOVE the effect you created with the Goosebumps. Thanks for the video! Awesome layouts! Love the stitching on your RR. I never take the time to hand stitch, but when I see it on your layout, it sure gives a WOW factor! Gorgeous projects!! I can't wait to see your faux glass technique video! What a wonderful project & video!! I'd have never thought about Goosebumps on acrylic [and a special thank you for the tip about removing StazOn]! Looking forward to watching more of your videos - and thank you so much for the chance to win the goodies!! Wonderful projects. Love the anatomy and masculine pages. Wowzers! Loving all of your projects this month! That masculine page is awesome & the anatomy page is gorgeous! Awesome album. I can't wait to check out the video to see how you created it!..All of your projects are fabulous!! oh my Rae, So many great creations here. You must have been busy! They are all so bright and detailed. I am envious. Love the album, and the layouts are so beautiful. The stitching on the last one looks great. Wonderful projects you've created. I love them all but the boy layout is especially unique! Great job! Wow Rae!!!! You really outdid yourself on those pages, and Oh my gosh...I loved your tutorial on the mini album cover...What you did was gorgeous!!! Wow gorgeous projects Rae! Love how you made 2 girly LOs and 1 fantastic masculine page! So talented! Oh Rae - everything is so pretty! I'm so intimidated by acrylic albums! Your inspiration is helping though! Thanks!! Hi Rae, all of your projects are awesome. The detail that you put into them is outstanding. How long did it take to hand stitch the last layout? that's labor of love. I've seen rubber stamped and machine stitching but not hand stitching. good job! 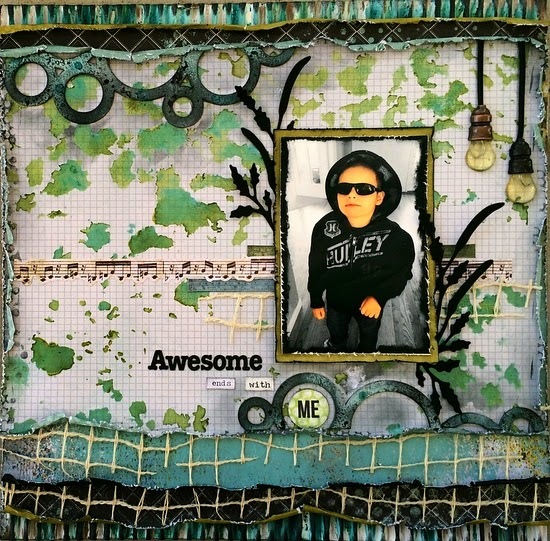 Gorgeous layouts, love the "Awesome", your album cover is amazing!!!!! Stunning projects, you have amazing talent! I love the "faux glass" album,I wish I could paint like that. Wow, your mini album and layouts are stunning! Thanks for the inspiration. Absolutely stunning. Love all your embellishments. All of the layouts were great but I especially liked the faux glass. It is so elegant and beautiful. The faux glass album is absolutely amazing. These are all so great but I love the carefree green circles and your daughter's sweet smile in the RR page!